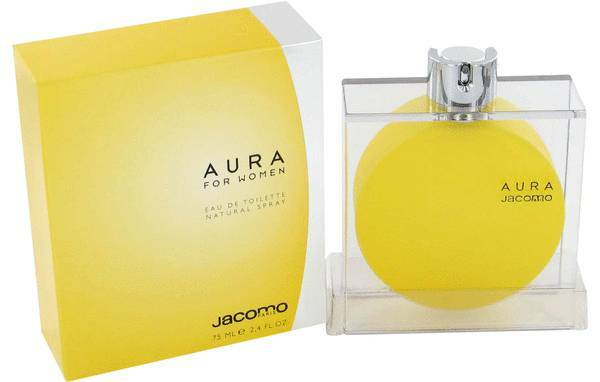 Aura Perfume by Jacomo, Created in 2001, Aura is a women’s floral fruity fragrance signed by perfumer Edouard Flechier . With moderate longevity and sillage, it’s a perfume for spring and summer days. At the head are grapefruit, freesia, mandarin orange, tuberose, litchi, and blackberry notes. Mimosa dominates the heart notes, followed by honeysuckle, lily-of-the-valley, peony, and vanilla. Heliotrope, musk, sandalwood, and vanilla make up the base notes. The flacon is round and yellow, then Read More Read More encased in a clear, square container, fitting its theme of geometric packaging. Jacomo is the fashion brand started by American James (“Ja”) Kaplan and Frenchman Gerard (“Co”) Courtin in 1970. The “Mo” was added as the third syllable to give the name a musical character. By 1983, the company established a production site for perfumes and cosmetics in Deauville, located in Normandy. 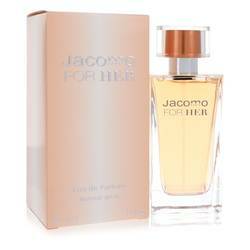 The brand was acquired by Sarbec Cosmetics in 1995 and continues to launch new fragrances. All products are original, authentic name brands. We do not sell knockoffs or imitations.